Much like Jason Collett, roots rockers the Wooden Sky hold a seasonal revue each December in Toronto. Their Fifth Annual Holiday Revue will take place on December 16 at 918 Bathurst, and the details of the event have now been confirmed. 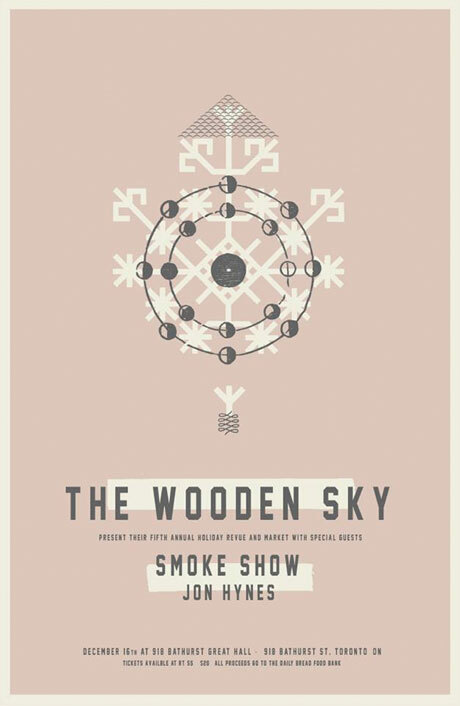 Fittingly, the Wooden Sky will headline the show. Also on the bill are Smoke Show, which is the latest project from Simone Schmidt of Fiver, One Hundred Dollars and the Highest Order. (She's joined in this band by Jeff Bierk.) The bill is rounded out by a set from Wooden Sky bassist Jon Hynes. Along with music, the night will include a so-called "holiday market," which consists of a curated group of local artists and craft-makers selling their wares. Local cafe Hello Darling will have snacks and refreshments for sale. Tickets cost $20, with all proceeds from the all-ages event going to the Daily Bread Food Bank. Attendees are encouraged (but not required) to bring a non-perishable food item for donation. Tickets can be purchased online here, or from Rotate This or Soundscapes. Learn more at Facebook. The Wooden Sky released their album Let's Be Ready earlier this year.